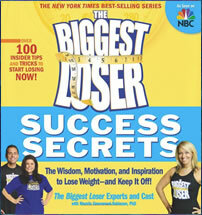 The Biggest Loser Success Secrets is a book written by previous contestants of the popular television program “The Biggest Loser”. The successful participants share their diet and exercise secrets and reveal the things that helped them to personally overcome the biggest challenges in their weight loss journeys. One of the major factors that the contestants agree on is that the true key to losing weight involves changing your behavior and attitudes, not just diet and exercise. They outline their own struggles and the strategies they used personally to overcome resistance to exercise, as well as how they continue to maintain healthy lifestyle habits. According the many of the contestants the most important component of a successful weight-loss strategy is finding the motivation to make the necessary positive changes in your lifestyle. Many of them refer to this as their “moment”; the point that triggered them to get started and keeps them dedicated to achieving their goals. The participants of the show provide advice on what to eat, how to burn more calories, what to do when you reach a plateau and how to set up a positive social support system. You are encouraged to keep a daily journal of what you are eating and your physical activity. Dietary recommendations are based on limiting your calories and eating three meals and two snacks each day. Fruit, vegetables, whole wheat bread, quinoa, chicken breast, eggs, cottage cheese, nonfat yogurt, turkey bacon, lean beef, almonds, sweet potato, fresh herbs, salsa, mustard. Contestants on the show work out on a very tough schedule, but this is because they are under the close supervision of their trainers and medical experts. Readers who are working out at home are encouraged to aim for sixty minutes of moderately intense exercise each day. If you have a chronic disease or are over the age of fifty you should consult your doctor before commencing a physical fitness program. Exercise should always be challenging but it is also important to choose activities you are comfortable with, that you enjoy, and that suit your strengths because this increases the likelihood that you will stick with it. Working with a personal trainer is recommended to help keep you accountable and maintain your motivation, but if you can’t afford this you might consider finding an exercise buddy. The Biggest Loser Success Secrets also includes an entire chapter on what you should do when you hit a plateau with your weight loss. The Biggest Loser Success Secrets: The Wisdom, Motivation, and Inspiration to Lose Weight–and Keep It Off! retails at $21.95. Appeals to fans of the television program “The Biggest Loser”. Many readers will find inspiration in the personal insights and successes of the contestants. Includes a chapter on what to do when you reach a plateau. Emphasizes goal setting and maintaining a positive attitude. Encourages keeping a journal of diet and exercise, which has been associated with a greater chance of successful weight loss. Recommends a long-term healthy lifestyle approach to weight management. Is not a complete step-by-step weight loss plan. Does not contain any particularly unique information regarding weight loss. A structured meal plan and recipes are not provided. Results are unlikely to occur as quickly as they do for the contestants on the television program. The Biggest Loser Success Secrets includes advice from successful participants of the television program on how to get and stay motivated, what to eat, how to overcome exercise resistance and maintaining a healthy lifestyle after you have achieved your weight loss goals. This book will especially appeal to fans of “The Biggest Loser” but it also contains sensible and practical advice suitable for anyone looking for guidance on how to lose weight. The Biggest Loser Club – The Biggest Loser Diet designed for you to do at home.